Pesto gives this bread a subtle tint with basil speckles, the aroma of parmesan and a pleasant pine nut crunch. A previous version of this bread I made was really tasty, but I wanted more pizzazz. So I upped the amount of pesto and added additional chopped pine nuts for more flavor and a subtle layer of texture. 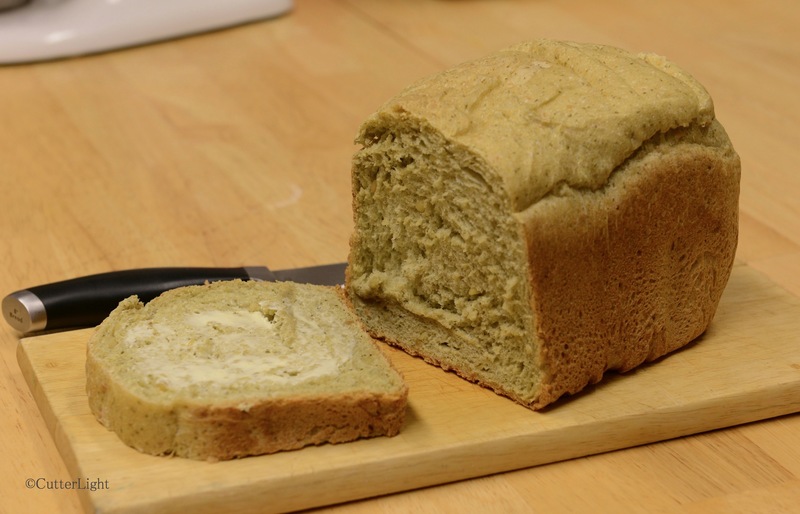 The mixture went into my Zojirushi bread machine and came out with the desired taste and texture but still light and airy. It was so tempting, half the loaf didn’t survive till the photo shoot! Place ingredients in bread machine in the order recommended by the manufacturer. Start machine. Remove baked loaf at the end of cycle and cool on a wire rack for at least an hour before slicing. ← Anniversary Crème Brûlée with a Surprise! I can just smell the pesto . . . I don’t have a bread machine but this sounds good enough to go for it the labor intensive way . . . would I let it rise until doubled, punch down and then rise again and bake at 305 degrees? The bread machine does go through two kneading and rising cycles. So we think your labor intensive way would work. We checked the owners manual and the bake cycle heats to 290 degrees F. We’d love to know how your experiment works if you try it.